Join us for an evening of WINE & DESIGN Thursday, April 25 from 7 – 9 pm with Ashlie DeArmitt of the Scarlet Lily. 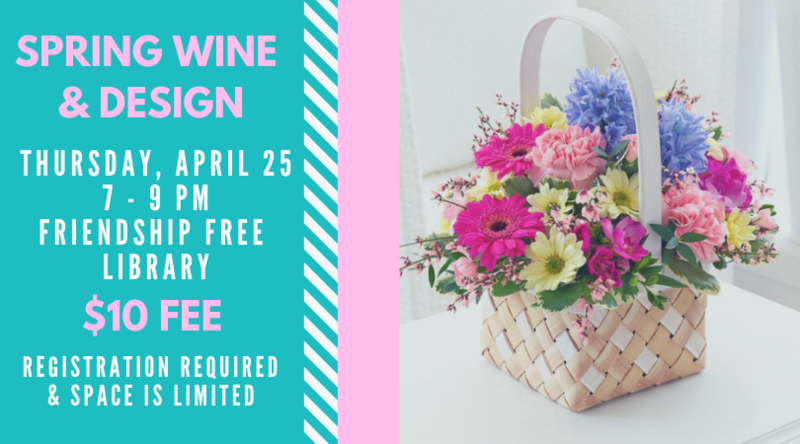 Sample complimentary wines and design and take home a floral centerpiece to brighten your home this spring. Please bring pruning shears or scissors to the event. There is a $10 fee to cover materials. Purchase tickets at the library or call (585) 973-7724 to reserve a spot. Space is limited, so don’t wait!